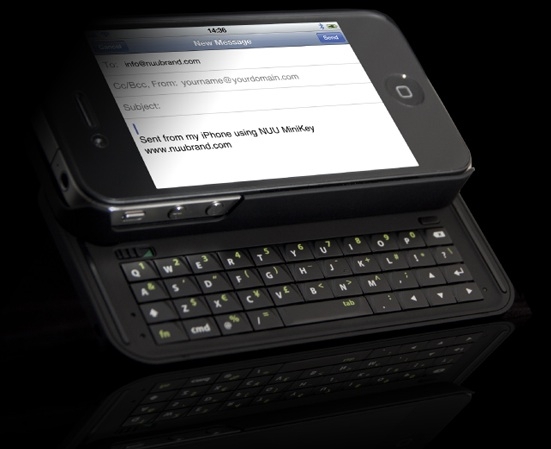 "The NUU MiniKey provides greater speed, better accuracy, and convenient function keys for heavy iPhone typists. This keyboard has great appeal for those who prefer tactile feedback while they type, and is particularly useful for anyone thinking of switching from BlackBerry to iPhone." Very interesting, and especially helpful for those wanting to switch from Blackberry or any number of Android phones that have the physical keyboard. The case offers some protection but also appears to stay pretty thin despite having that slide out keyboard. I do like that you get the whole screen to use, the backlighting and that it has a sleep mode that follows along with the iPhone, shifting on seamlessly when it senses you need to type. You can find out more about the case at NUU, or if you are convinced you need one, head over to the affiliate store and purchase one there for $79.99 USD.